Cape Town - The Investec-songo-Specialized train continues to rush toward Absa Cape Epic victory and such is their control of the Women’s category that even when things go wrong they seem to be only temporarily derailed with no damage to their title prospects. On Thursday Annika Langvad and Anna van der Breggen had their biggest drama so far at the 2019 Absa Cape Epic when Langvad had a fall due to a “lack of concentration”, but luck certainly seems to be with the pair of world champions as she remounted quickly and the pair easily rode to their fifth win in five stages. The 43km Time Trial on the trails around Oak Valley Estate simply provided another stage for the four-time winner and her debutant partner to show off their dominance, and it was no surprise they added one-minute 44-seconds to their lead over the second-placed Summit Fin team of Candice Lill and Adelheid Morath. Ariane Lüthi and Maja Wloszczowska (Kross-Spur Racing) ended third, two minutes further back. The results did not change the top positions with Langvad and Van der Breggen extending their lead to over 25 minutes, while Summit Fin are now eight minutes clear of third-placed Kross-Spur Racing. "It is a long race and we have been racing for many days in a row and I think I lost concentration a bit," said a dusty but otherwise unscathed Langvad after the finish. "Luckily it was in a safe spot. "I fell on a sandy part and just slid off the edge. My bike was stuck in a small bush and I was pulling to get it back on the trail but it was not moving. "This race is not easy at all. In this race you have to maintain concentration and focus all the time, and you are so tired all the time. That is the real challenge. 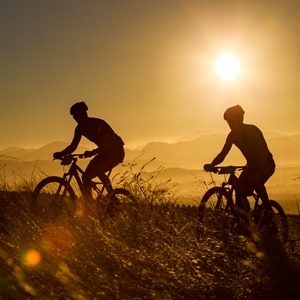 It is so different going for a two hour ride and doing a course like today when you are well rested, and then going and doing it on the fifth day of the Absa Cape Epic." And then in her first admission that the team is beginning to contemplate the overall victory, Langvad added: "I am glad to have made it through today … we are slowly starting to count down the days." Van der Breggen said she was never worried, even when she heard her partner slid off the side of the trail: "I knew it was not too deep there and knew she would come out again. When I looked she was fine." With five days of racing completed and just three more to go, it seems the only way Investec-songo-Specialized can be beaten is through a major mechanical. However, the race for second is still very much alive although Lill and Morath seem to be growing in strength. "It was quite a cool Time Trial today," said a remarkably fresh Lill just after climbing off her bike. "It was a bit refreshing compared to yesterday’s long open slog. There was some really nice singletrack today. It was awesome, we went through the amphitheatre twice and there were a lot of people at Paul Cluver cheering for us. "Our plan was not to smash it too hard today. You cannot win or make up significant time on a 43km Time Trial so we just wanted to protect our second place and ride smooth. “We had no dramas. We are riding very conservatively. Our approach is to hold back a little and to not lose a lot of time with a mechanical. "Tomorrow (Friday) is going to be a massive day. I think it is going to be the biggest day of the Absa Cape Epic." Friday’s stage is the Queen Stage and competitors face a tough 100km with 2 850m of climbing as they make their way from Oak Valley to the new race village at Stellenbosch University. On Thursday Theresa Ralph and Sarah Hill of team Galileo Risk added to their lead in the Absa African Women’s race and are currently lying sixth overall.